(Left to Right) Jake Cass, Chris Polashenski, Bob Pickart, and Kevin Arrigo during a lighter moment in the planning stage. We’ve been talking about ice and light, nutrients and plankton, and occasionally polar bears, but little about the setting in which all of the things are contained—the ocean. To begin rectifying that oversight let’s parse the ocean action in the Chukchi Sea and place it in its broader Arctic context. We’re talking, then, about physical oceanography, the study of currents that course through the body of the ocean like blood vessels in the human body. But because we cannot see the circulation with the naked eye, physical oceanography requires a measure of imagination to cast our minds across vast distances and into opaque depths. So let’s picture the Chukchi as a shallow cone-shaped sea bounded in the west by Siberia, in the east by Alaska, and in the north by the continental shelf break where the Chukchi shallows plunge some 3,500 meters into the abyssal depths of the Arctic Ocean basin. Through the Bering Strait, that nozzle-like opening at the point of the cone, 0.8 million cubic meters of Pacific Ocean water flow northward every second into the Chukchi. We can think of that as “downhill” flow because of this remarkable fact: The elevation of the Pacific Ocean is literally higher, by about 50 centimeters, than the Atlantic. This is so because the Atlantic is saltier, therefore denser, more compressed than the Pacific. 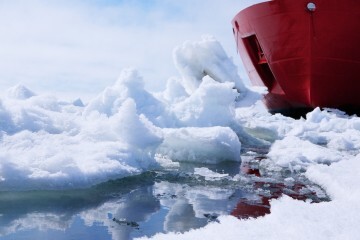 By world-ocean standards, 800,000 cubic meters per second is not huge volumetric transport (the Gulf Stream, at its maximum, transports some 150 million cubic meters per second); however, it’s still significant as a purely oceanographic matter and as one of the Arctic’s climatic determinants. Flow schematic of the Chukchi Sea. Much of the Pacific-origin water entering the Chukchi from that single nozzle eventually exits on the east side of the cone to flow eastward along the North Slope of Alaska. 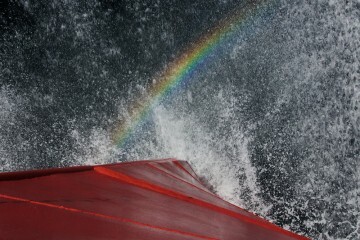 But in between lies the complex, dynamic system that physical oceanographer Bob Pickart wants to understand. Ocean-currents are usually shaped and directed by bottom features; they’re “bathymetrically steered,” as the pros put it. Once clear of the Bering Strait, the current splits into three branches. The western and central branches bifurcate around a high hump called Herald Shoal. 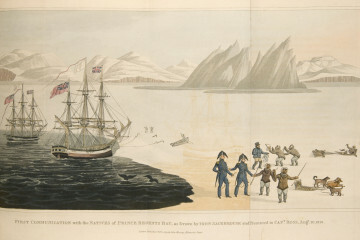 The former follows steep contours through Herald Canyon into Russian waters, where we cannot go. 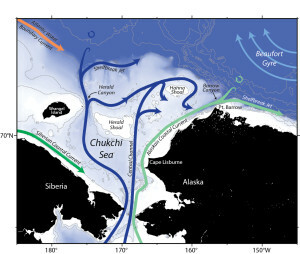 The Central Branch takes the eastward path around Herald Shoal, while the third, called the Alaska Coastal Current, hugs the sharp drop-off close aboard the coast. This three-branch pattern of ocean action is well known, thanks in part to Bob’s previous research aboard Healy. We know too that, while all the water passing northward through the strait is of Pacific origin, its complexion varies significantly with the seasons. Winter-water delivers rich nutrients churned up into the water column, by that process of brine extraction described earlier, where they’re poised to feed photosynthesis. 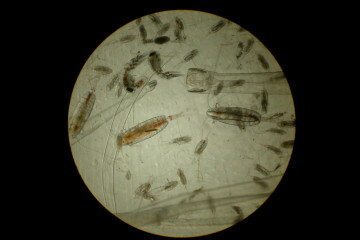 Now we’re waiting for the light to trigger the plankton bloom. 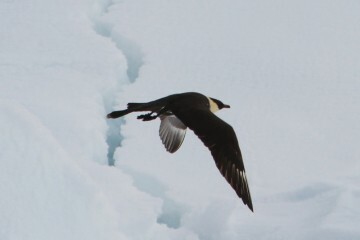 But nature’s timing is far stricter in the Arctic than elsewhere, the balance of life more delicate. 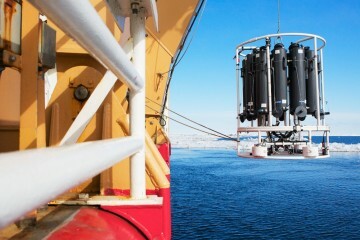 Come spring in the sector of the Chukchi we’re studying, nutrient-poor “summer” water will flush the winter water off the shelf, leaving a relatively barren sea. That’s just one of the ways ocean, ice, and biota intermingle to form a dynamic unity. And speaking of intermingling, in order to understand the composition and function of that unity, the three different scientific disciplines at work aboard this research vessel must cooperate, but that’s not always so simple. For example, Chris, the sea-ice scientist, would just as soon park Healy and measure the light penetration as melt ponds form and the plankton bloom around us, but not Bob. I’ve sailed enough with him to know that he likes to move fast, take a lot of temperature, salinity, and velocity measurements in high-resolution patterns to learn the local as well as the broad-scale ocean dynamics. 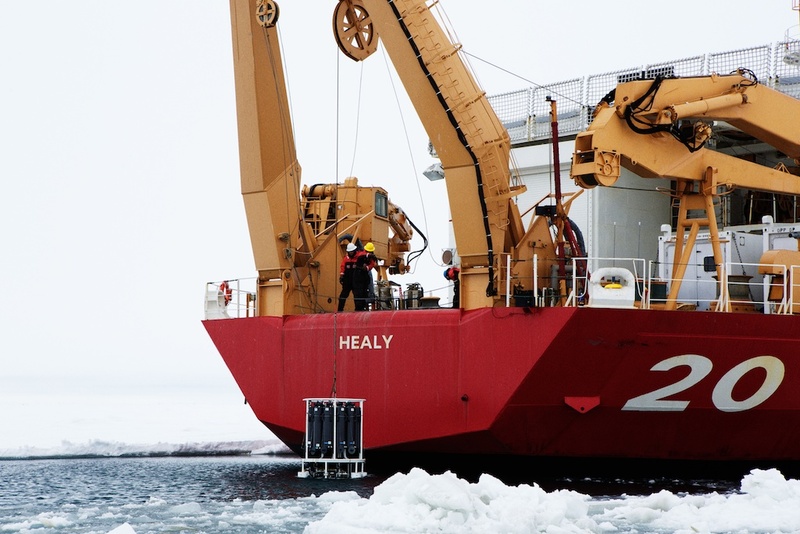 Unless there’s a handy polynya at Healy’s stern through which to drop the CTD (measuring the water’s temperature/salinity fingerprint), the recurring ice deployments don’t really serve physical oceanographic interests. Of course, these guys, including biologist Kevin Arrigo, who needs to move more than Chris but less than Bob, are top-line pros and willing collaborators—the National Science Foundation funded the expedition on that basis—but it’s interesting to note that their respective means of and objectives behind data acquisition are not inherently harmonious. As to the broad scale, Bob wants to explicate the mechanism by which cold winter water “leaks” off the continental shelf and spreads across the Arctic Ocean. To understand why, let’s cast our minds to the other side of the Arctic. There, through the wide gap between Greenland and Norway, the Gulf Stream system transports enormous quantities of warm and salty Atlantic-origin water into the Arctic Ocean. Because it’s salty, therefore heavy, Atlantic water sinks and fills the basin. Atop this warmer water floats a layer of cold but fresher (therefore lighter) water, some of which originates in the Chukchi Sea. This matters because that relatively thin cold layer “protects” the Arctic ice cap from the warmer Atlantic layer below, which were it to come in contact would melt the ice cap “overnight.” But what will happen to that insulating layer under climate-change regimes? Will it thin enough to lose its insulating properties? How much cold water does it take to protect the ice cap? No one knows, because it’s so damn difficult and expensive to work in Arctic waters. 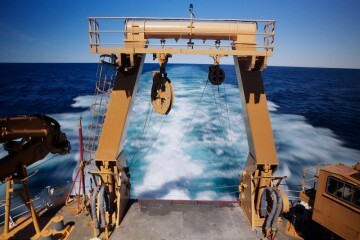 So oceanographic research seeking answers to such broad geophysical questions has to happen in small stutter steps of which this, aboard Healy, is one. But will climate change outpace research trying to reckon it? Has it already done so? No one knows. Yet. Still, it seems a bit reductive to imply that Bob, Chris, Kevin, the others aboard this and kindred research vessels are doing their work only because of its direct relationship to climate. Indeed, climate change lends urgency to most Arctic research, but these people would likely be pursuing the same objectives even if climate change were a less crucial concern. Scientists are in the business of understanding the nature of the world we live in. That’s reason enough for the rest of us to pay attention, and for now to watch over their shoulders as they do so.